"This was my great-great grandmother's recipe. 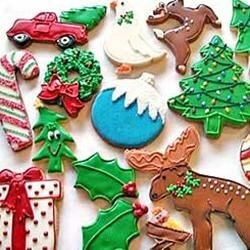 We make it every year and ice the cookies, rather than sugaring them!" Cream the sugar with the shortening. Stir in the egg, salt and lemon flavoring. Combine the milk and the evaporated milk. Dissolve the baking soda in the milks. Add this mixture to the creamed mixture and combine well. Stir in enough of the flour to make a stiff dough. You can either roll out the dough and cut with cookie cutters or roll the dough into balls and press flat with the bottom of a glass. If desired sprinkle the cookies with sugar before baking. Bake at 350 degrees F (175 degrees CO for 10 to 12 minutes or until cookies are soft and lightly browned around the edges. Be careful not to overbake! My family really didn't care for these. We won't make again. Very good!! easy to handle and held up well during cutouts. liked the slight lemon taste. Very yummy!!! Mine were a bit sticky at first... perhaps because I was using 1% milk... I just added a bit more flour and it was fine! These were fantastic, reminded me of my great grandmother's sugar cookies. I will be making them again. I also made a batch with almond flavoring, also very good.